Since we live in the land of perpetual wetness, slugs and snails should be on the state flag. I've been a little paranoid about how to prevent them from nibbling away on the plants I grow this year. To top it off, my brother, who lives in a third story condominium downtown, is currently having a slug infestation with some plants on their deck. Where they come from I know not -- they must be via some new plants. Either way he is in the middle of a slug death match complete with beer traps and the ever exciting "hand" removal. Which, since they are so tiny, involves him out there in the dark with chop sticks (he's pretty good with them, by the way). Anyhoo, I thought I'd do the beer traps but decided to spend the money on copper barriers. Sure, they were expensive. 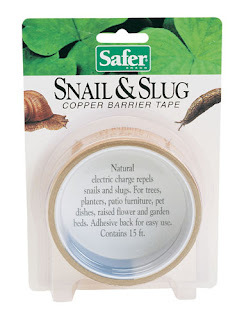 But they don't look half bad on the beds and I get the fun of thinking of all those slugs and snails happily crawling up the beds at night thinking they are in for a big ol' snack when, ZAP, they electroshock themselves and fall off the sides. I don't know if I'll have a bunch of slug carcasses littering the lawn, but if it does kill them perhaps the neighborhood birds can focus on them instead of my berries? I'll let y'all know if it works! Too bad the copper tape doesn't work on cats. OMG, I forgot all about the slugs! I always wonder how early settlers dealt with all of this. We get slugs in the house! They come in through the kitchen wall under the sink. I use salt and beer on them outside. Inside I flush 'em.